On October 2017, MaxisONE Prime was introduced. Maxis offers 2 in 1 package, Internet broadband with a mobile unlimited monthly package. 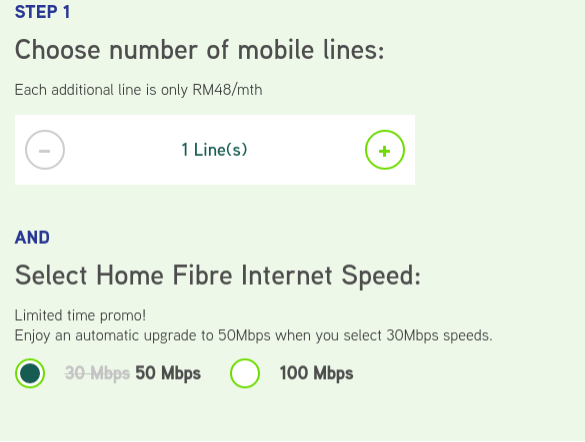 Before this Maxis offers only 30Mbps and 100Mbps. Now, besides limited offers by Maxis for MaxisOne Home. Same as other promotional offers, this package also comes with a contract for 2 years, so the price will come to normal price after that. So if you are looking for fixed line broadband with mobile internet, you can check this new package MaxisONE package 50Mbps with unlimited data mobile internet with RM367 per month. But before you decide to buy the new package MaxisONE Prime, you can check Maxis Broadband Coverage to make sure you will get full 4G in your area. Every Telco holder claims that their network is fastest and reliable with 4G LTE. But how we want to check if their claims is true? 4G LTE is a two terms terminology. 4G means the 4th generation of data technology for cellular networks. LTE stands for Long Term Evolution, that is for high speed data network for mobile and device. When combine together, they make the fastest 4G service available today.4G LTE is 5-10 times faster than 3G network. In order to get the fastest network you can check online your MAXIS network coverage. A map will show 4G LTE and 3G network coverage. Make sure you have 4G LTE phone and 4G simcard to enjoy the fast data streaming online. In case you want to check Celcom network coverage you can visit this website. For DIGI, you can go to this website. If you can compare the three Telcos, clearly Maxis and Celcom have most 4G LTE coverage than DIGI. So the choice is yours. Infolient Broadband is a new internet service provider in Malaysia which offers improved quality internet services that is more reliable, faster with value added contents and applications that give more value for money. Infolient Broadband is able to provide a better service and at a reasonable price because it is created and developed by a group of top IT specialists and enthusiasts who are hands-on and have the in-depth knowledge in the full spectrum of internet services. INFOLIENT was established in 2004 with the objective to provide ICT solutions for clients, right from individuals through the simple traditional businesses, private enterprises to multinational organizations, government departments and ministries. Our core businesses are based on 3 main pillars – value added broadband and internet products and services, Networked IT Services, and Telecommunication services.